Vendetta Online takes place in a science fiction game world and offers an MMORPG experience for PC, Mac and your smart phone (iOS and Android). The game went commercial in 2004 and uses a cheap subscription model charging players only a single dollar every month across all platforms. 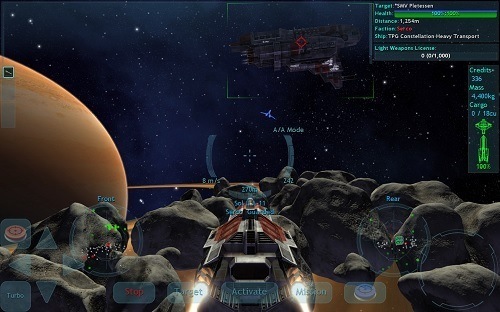 This unique multiple platform support lets players all access the single galaxy from a number of devices. Vendetta Online has a long and detailed game setting that covers over 2000 years of human history that has led to the current state of the galaxy. This back story also includes very in depth accounts of the three factions that inhabit the galaxy and their motives. Vendetta Online has a focus on reaction gameplay, immersion and a balanced mix of PvP and PvE content for players to enjoy. Combat is extremely fluid with players having great control over their ship allowing movement around the 3D space. Combat involves players having to line up their shots against opponents while being able to avoid their weapon fire. Depending on the weapon you’ve equipped you can expect a different weapon velocity and fire rate. Players can also expect combat to differ based on their ship mass, cargo hold space and faction as each has their own unique equipment. As players advance through the game lots of varied end game style content becomes available which is where Vendetta Online really shines. These activities include joining the galactic military to prevent the spread of NPC robots, raiding large cargo ships, racing or taking part in territorial faction wars. 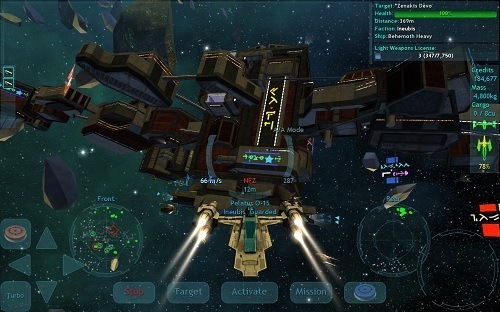 One of the most popular large scale operations is the ability for players to capture stations and use them to produce rare and unique items. Players must group together to not only take over these stations but also defend them from other players. Crazy amount of game activities to participate in. Subscription based but a bargain price (free trial available). Fluid combat with twitch based features. Huge world with a lengthy history.